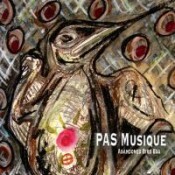 “Repetition, beats, and field recordings” form the basic sound-set on PAS Musique’s new release, Abandoned Bird Egg. With an eye toward creating a “meditative” experience, Robert Pepper and his crew take those elements and assail your listening space with thick swaths of gurgling electronics pinned under industrial weight, accented with IDM-style voice samples. I throw quotes around “meditative” because while the dense sonic atmosphere and buzzing, drone-like undercurrent can forcibly lull you into a kind of numb stupor, it comes fully edged and barbed and is in ceaseless, abrasive motion. A lot of the sound on Abandoned Bird Egg is super-dense, mercilessly piled upon you into whirlwind cacophonies anchored, now and then, with thudding and, if I may, catchy beats. In other places, as on “The Light Side,” the drones take hold, possessing their own considerable weight. Here they take a white-noise hiss and an incessantly repetitious sequencer riff, distort the sound like it’s over-amplified, ramp it up and down in intensity, and pull back the edges to let additional sounds leak out to keep you aware. And just so you can’t really get a handle on what’s happening, there’s always the clumsy funk bassline that welcomes you into “Dark Canopy.” But don’t get comfy–this soon rises up with spurts of feedback and more aurally aggressive clusters of sound. As challenging and rough as it is, I actually find Abandoned Bird Egg to hold some of the most approachable work I’ve heard from PAS. It’s not an easy listen by any measure, but there are enough familiar elements to let you take hold of something in the storm. You have to like your noise, but here’s the thing–this is purposeful noise, a chaos that actually achieves what the artist sets out to do. It may be the weirdest meditative experience you’ll ever have, but if you can find your way in, I assure you this stuff will carve out its own space in your ahead. But still, approach with caution. It’s not for everyone.